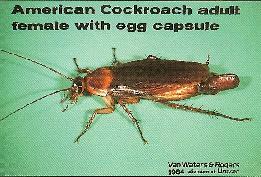 Largest urban pest cockroach. Up to 2″ long. Adults reddish brown with yellow margined pronotum. Average 15 eggs per capsule, Over 1 year to the mature adult. Prefer warm, damp areas: Sewers, Basements- common outdoors. 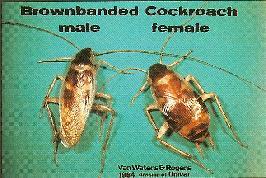 Adults 3/4″ long, Tan with 2 black, longitudinal marks on pronotum. Average 30 eggs per capsule which is carried by female until ready to hatch. Only 3 months to the mature adult. 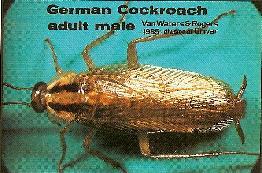 Most common structural cockroach, a non-flyer carried into structures by man. Likes cabinet hinges. Adults about 3/4″ long. Males much smaller than females. Identified by 2 broad bands crossing the thorax. Egg capsule small, average 15 eggs, glued to hidden surfaces by female. Egg to mature adult in about 6 months. 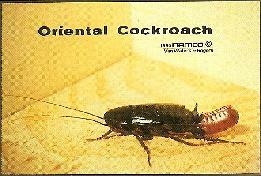 Individuals may be found throughout structure, and not as dependent on moisture as other species of cockroaches. Adults black and over 1″ long. Non-flyers, as males have shortened wings. Females only with wing pads. Average 15 eggs per capsule. 1 year to mature adult. Common outdoors and in damp areas such as basements, and other underground habitats.